For indoor use. For installation in plenum space and drop ceiling. Attaches to ceiling thickness range: 10 mm to 60 mm. IP52 ready (enclosure). Network cable coupler indoor included. NOTE: The drill hole diameter for the ceiling is 145 mm (5.7 in). 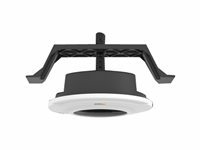 AXIS T94B03L Recessed Mount is designed for discreet installation on walls or ceilings. 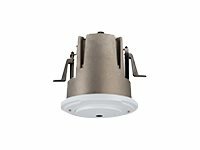 The recessed mount is compatible with the AXIS M20 bullet-style cameras and applicable for indoor environments as well as outdoor use. It is also suitable for installation in plenum, as the back box is made of metal with a M20 1/2" hole for cable protection. 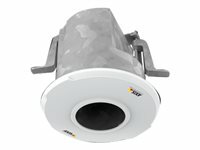 The outdoor-ready AXIS T94A01L Recessed Mount is designed for discreet and elegant installations of AXIS Q60-E PTZ Network Cameras in roof overhangs/soffits. Appreciated outside retail stores, hotels entrances and larger residential buildings. Made of aluminum and stainless steel it supports both safety standards and the impact resistance of the camera. 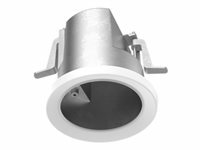 Together with the recessed mount, AXIS Q60-E can be mounted in panels, wood or pre-made holes in solid concrete. The mount is very sturdy and made of aluminum and stainless steel. It supports IK10 rating, which makes the mount impact resistant to secure the installation from tampering. It also offers two 3/4" conduit holes for a plenum and/or rodent safe installation. 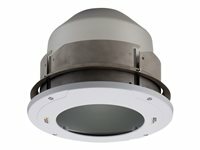 AXIS T94B05L Recessed Mount is designed for discreet installation in drop ceilings, indoors. It is also suitable for installation in plenum (air-handling spaces), as the back box is made of metal with a M20 1/2" hole for cable protection. Includes cover lids and spacers for all compatible camera products.